The Bayreuth Festspielhaus or Bayreuth Festival Theatre (German: Bayreuther Festspielhaus, pronounced [ˈbaɪ̯ʁɔʏ̯tɐ ˈfɛstʃpiːlˌhaʊ̯s]) is an opera house north of Bayreuth, Germany, built by the 19th-century German composer Richard Wagner and dedicated solely to the performance of his stage works. It is the venue for the annual Bayreuth Festival, for which it was specifically conceived and built. Its official name is Richard-Wagner-Festspielhaus. Wagner adapted the design of the Festspielhaus from an unrealised project by Gottfried Semper for an opera house in Munich, without the architect's permission, and supervised its construction. Ludwig II of Bavaria provided the primary funding for the construction. The foundation stone was laid on 22 May 1872, Wagner's 59th birthday. The building was first opened for the premiere of the complete four-opera cycle of Der Ring des Nibelungen (The Ring of the Nibelung), from 13 to 17 August 1876. Only the entry façade exhibits the typical late-19th-century ornamentation, while the remainder of the exterior is modest and shows mostly undecorated bricks. The interior is mainly wood and has a reverberation time of 1.55 seconds. The Festspielhaus is one of the largest free-standing timber structure ever erected. Unlike the traditional opera house design with several tiers of seating in a horseshoe shaped auditorium, the Festspielhaus's seats are arranged in a single steeply-shaped wedge, with galleries or boxes along the back wall only. This is also known as continental seating. Many contemporary movie theaters have adopted this style of seating, which gives every seat an equal and uninterrupted view of the stage. The capacity of the Festspielhaus is 1,925 and has a volume of 10,000 cubic metres. The Festspielhaus features a double proscenium, which gives the audience the illusion that the stage is further away than it actually is. The double proscenium and the recessed orchestra pit create – in Wagner's term – a "mystic gulf" between the audience and the stage. This gives a dreamlike character to performances, and provides a physical reinforcement of the mythic content of most of Wagner's operas. The architecture of Festpielhaus accomplished many of Wagner's goals and ideals for the performances of his operas including an improvement on the sound, feel, and overall look of the production. The Festpielhaus was originally planned to open in 1873, but by that time Wagner had barely raised enough money to put up the walls of his theatre. He began to raise money by traveling and putting on concerts in various cities and countries throughout Europe. There are, however, some documents concerning the donation and aid (900 thaler) to Wagner for that matter by the Sultan Abdülaziz of the Ottoman Empire. Even after Ludwig began funding the project, Wagner had to continue putting on concerts to keep the building project financially afloat. The tours were very taxing on Wagner's health and would eventually be a key element to his death later on in 1883. A significant feature of the Festspielhaus is its unusual orchestra pit. It is recessed under the stage and covered by a hood, so that the orchestra is completely invisible to the audience. This feature was a central preoccupation for Wagner, since it made the audience concentrate on the drama onstage, rather than the distracting motion of the conductor and musicians. The design also corrected the balance of volume between singers and orchestra, creating ideal acoustics for Wagner's operas, which are the only operas performed at the Festspielhaus. However, this arrangement has also made it the most challenging to conduct in, even for the world's best conductors. Not only is the crowded pit enveloped in darkness, but the acoustic reverberation makes it difficult to synchronise the orchestra with the singers. Conductors must therefore retrain themselves to ignore cues from singers. The first violins are positioned on the right-hand side of the conductor instead of their usual place on the left side. This is in all likelihood because of the way the sound is intended to be directed towards the stage rather than directly on the audience. This way the sound has a more direct line from the first violins to the back of the stage where it can be then reflected to the audience. The rest of the orchestra is located directly under the stage. This makes communication with the conductor vital as most of the players are unable to see or hear the singers, but creates the huge, rich sounds Wagner sought to compose. The Festspielhaus remains the venue of the annual Bayreuth Festival, during which Wagner's later operas, such as the Ring cycle and Parsifal, are given on a repertory basis. In 2014, photos printed on canvas hide the scaffolding around the Festspielhaus. In early 2012, Katharina Wagner mentioned the need for repairs to the building, with mention specifically of roof leaks and crumbling of the red brick facade. In 2014, funding for restoration was announced at a level of approximately 30M €, primarily from public funding shared between Germany and the state of Bavaria, with the German national government and the Bavarian state government holding majority shares. Repairs were completed on 26 July 2015 and the building is fully restored. ^ "The Bayreuth Festival Theatre". The history of the Bayreuth Festival. Bayreuther Festspiele GmbH. Archived from the original on 21 October 2010. Retrieved 25 December 2009. 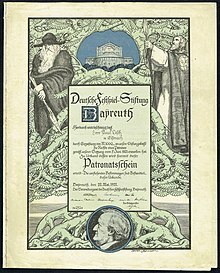 ^ Das Rheingold and Die Walküre, the first two operas of the cycle, had premiered individually at the National Theatre in Munich in 1869 and 1870 respectively; the 1876 opening of the Festspielhaus was both the premiere of the latter two operas, Siegfried and Götterdämmerung, and the first time all four were performed together as a cycle. ^ a b Barron, Michael, Auditorium Acoustics and Architectural Design (2nd edition). Spon Press (Abingdon, UK), ISBN 0-203-87422-6, p. 352 (2010). ^ Cadenhead, Frank (2 February 2012). "Bayreuth's Festspielhaus Needs Repairs". Opera Today. Retrieved 2 March 2018. ^ "Geld für Sanierung des Bayreuther Festspielhauses kann fließen". Fränkischen Tag (in German). 20 March 2014. Retrieved 26 July 2014. ^ Rick Fulker (23 July 2014). "Calm after the storm as Bayreuth Festival opens". Deutsche Welle. Retrieved 10 February 2015. ^ "DW Music at Bayreuth". Deutsche Welle. 25 July 2016. Retrieved 2 March 2018. Spotts, Frederic (1994). Bayreuth: A History of the Wagner Festival. New Haven and London: Yale University Press. Burlingame, Edward L. (1875). Art, Life, and Theories of Richard Wagner. New York: Henry Holt and Company. Wikimedia Commons has media related to Bayreuth Festspielhaus.